If you go to a sports shoe store these days you can see a lot, and I mean a lot of Cross training shoes on the walls. These are now common place and it’s because of this phenomenon called Crossfit and you will be sure to find the Reebok Crossfit Nano 8 Flexweave shoe. Many gyms are taking parts of Crossfit and importing them into their gym training classes under a new name that sounds cool and trendy. This evolving fitness trend is great and as a result of it, we see shoes on the shelves we have never seen before. These shoes are also very popular in strength sports. They are a unique shoe designed to be flexible, but strong. They have stiff soles and much more support in the heel and a wider toe compartment. Reebok jumped on the bandwagon first back in 2011 when they introduced the Crossfit Nano shoe that is the most popular shoe worn by Crossfit athletes to this day and we are up to the 8th generation and going strong. As I said, this is a unique shoe. I was very excited when I heard of one of the biggest difference it has from all other generations, that is the inner ‘bootie’. What I mean is that it has an inner shoe that is separate from the outer shoe. It is again, completely separate from the outer shell. 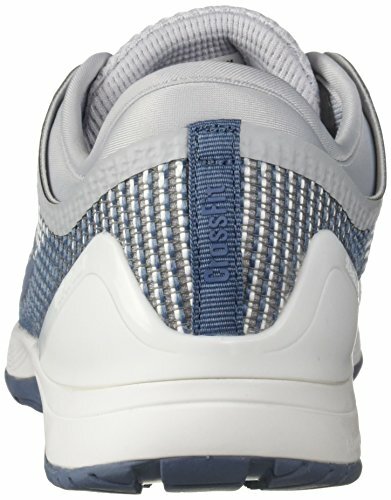 Today I will do my review of the Crossfit Nano 8 Flexweave and as usual I will break it into material, functionality, price, and because it is a shoe, I will go into how stable it is. When I was thinking of how to write this bit, I decided it had to be broken down into main core movements we do in Crossfit because after all, the shoe is designed for these moves. For a front or back squat we mean under the weight of a bar with heavy plates on it and what the shoe offers for this. The sole is hard and has little give. This is what you want when squatting. You don’t want a soft squish unstable platform for your foot to base on. It makes you pretty comfortable in full squat and coming up out of a full squat. This is a big plus in my book and I really noticed it. The wider toe toe was a surprise to me when I set my feet before lowering down into a squat. I felt I had more room and wasn’t jammed against the side of my shoe. The more I can widen my feet the more stable I feel under load. The ropes can destroy shoes quickly and easily. The rope is wrapped tightly around your foot when under your body weight which stresses the shoe material. When sliding down, the rope is again your brake when coming back down and slides under tension against your feet again. I’ve had my shoe rip and the sole tear and peel back. So hearing the flexweave was tough enough to save my shoes, I was all for it. Now for a movement that tests the flexibility of the shoe. Squat down and stand up movement make our ankles flex and extend. I haven’t had a shoe I didn’t feel getting tight around the lases and the sides. The Reebok Crossfit Nano 8s left me with no feeling at all doing this movement. This Nano 8 has a new word attached to it, Flexweave. Lets just have a look at that. Looking at it closely, you can see that is a cross weave, a bit rough, but very durable that will hold up to what has destroyed my shoes in the past, the rope climb. Rope climbs are notoriously tough on shoes and this year it appears Reebok has addressed that. The weave is very flexible which is definitely needed when doing Crossfit and breathes better than what I have worn in the past. I think the last few generations breathed well and this shoe is even better. This generation Nano has a slightly wider toebox than previous generations to allow for better splaying and gripping with your toes while squatting, and lifting and out and climbing. There’s the plastic heel cup that is similar to what the Nano 7 offered. It feels like your heel is held squarely in place when you are on your heels during squats and other lifts or skills where you are heel down. The sole is very hard providing solid footing for many movements requiring it. Now lets look at the bottom. Ever look at the bottom of your running shoe and wonder if the tread pattern is for show or not. Many times for designer and fashion runners it is, but in the case of the Nanos the tread pattern is very functional. The tread is in a blade pattern at the front of the foot and can grip anything you need to in the gym with no problem whatsoever. It has a wide spaced sort of wiper-blade pattern with the second and third rows slightly turned under where the ball of your foot would be. The rubber is thick and solid which is something I have come to look at closely on my shoes simply because of previous shoe failures. Yes I like this. In the middle of your food or ‘mid foot’ and the heel area the tread pattern is more linear which is good for lateral traction and for rope climbs. This traction mid foot under the arch is called RopePro for Reebok Shoes. Compare this type of shoe with any other athletic shoe and it wins hands down with rope climbs. Inside this new Flexweave shell sits the ‘bootie’. Flexweave is great, but it is ruff and does not have a very good feeling to the touch. Having this rub against even a sock covered foot would cause redness and very sore skin. So, the’bootie’ is the shoe’s boot so to speak. It is a softer liner that feels just as great if your are bare-footed or sock footed. It breathes well and really must so your feet aren’t’t bathing in sweat. The ‘bootie’ is connected to the outer Flexweave shell and it is held in place quite tightly so it doesn’t free float around. Some people have wondered if this connection is strong enough to last. My opinion is that it is. Laces are not usually talked about unless there really is something to talk about. There is. The eyelets run high up on the shoe which allows you to lace up higher pleasing those who like that little extra stability. This shoe is designed for Crossfit. Those who complain the shoe isn’t comfortable when doing other things like going for a walk or a long run are not really using this shoe for what it is meant for. In my post talking about wearing the right shoe for the right activity? This is what I mean. The Reebok Crossfit Nano is made for Crossfit folks. I really like these shoes and personally I think Reebok has hit this one out of the park. I never did buy a Nano 7 because many people thought it was a bit of a miss and a step back. What I really like is the heel cup and the wider toe box. These two are my tops and what I notice each and every time I go to the gym. It is stiff but flexible and some feel it is too flexible. I like the flexibility of the shoe and the comfort of the ‘bootie’. The extra flex to the shoe doesn’t impact my performance at all and doesn’t make me feel less stable. This looks like a good shoe to consider even if you’re not into crossfit exercises. There are so many shoes on the market which wear out too easily. Even though $130 is a bit expensive for a pair of shoes, it might be cheaper in the long run. These shoes sound like they could last for years, and that’s cheaper than replacing a poorly made pair every few months. Enjoyed your review of the Reebok Crossfit Nano 8 Flexweave. From your review it certainly seems to be a great fit for a crossfit shoe. And to be honest, it’s nice to look at as well. Great to hear that it’s functionally a good shoe. Despite being 50 I continue to do squats in my workouts. My knee’s don’t always like it but I find it’s the single best lower body exercise. With the stability of this shoe it appears to be a great fit for squatting. Heck, maybe my knee’s will even thank me. The weave certainly seems like a great feature to improve the durability of the shoe. I tend to wear my workout shoes out in less than 2 years. The only thing I don’t love about these shoes is the price. To be fair as you put it the price is fairly consistent with other cross training shoes. I just need to quit worrying over that. With shoes you tend to get what you pay for. Seems like a great shoe, thanks for the review. I’ll got check them out. Great Post! Those shoes sound cool. who calls their shoes Nano 8 flexweave (obviously Reebok does)? Squats used to scare me (as free weight squats should to keep you alert! ), but perhaps shoes like these would have changed that. It is easy to forget the incredible technology available for our feet but you have certainly reminded me of it. It sounds like this shoe hugs your feet and provided the best support you could ask for when exercising The heel support and toe box space sound especially comfortable..
A little while ago I started doing, and although in general I feel very well and I am beginning to see significant benefits in my health and my physical condition, I have started to feel some discomfort in my knees. Some people have told me that it is because I have to change the model of shoes for ones that better support the impact of the knees on the leg. Do you think that these shoes would be suitable for this purpose? I am glad to hear the toe box is wide as I have wide feet. I like the idea of the extra bootie inside for comfort from the durable flexweave. The thick and solid sole for good support sounds great plus the plastic heel cup for added stability. Along with the high up running lace eyelets these sound perfect – comfortable, stable and durable. The price is a bit higher than I usually pay for shoes, but I will consider the Reebok Crossfit Nano 8 because the benefits are so right for the gym.